In the video "WHERE IT ALL ENDS IT BEGINS" the camera is aimed at a rotating ceramic bowl. The bowl serves as a recording device both in the actual and figurative sense. She answers, listens, thinks and speaks - only quietly inaudible. A rhythmic sound creation accompanies the moving pictures. In the production of the video, the bowl was held and rotated slowly, just as it was made by holding and turning. The camera picks up the circular motion like an infinitely repeating description of a body. 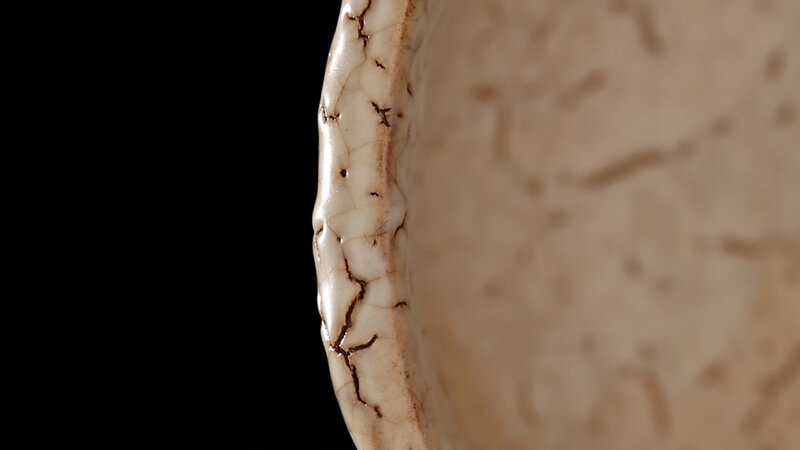 The skin-like hue and the cracked surface structure of the bowl were lit by side lighting; so to speak, the inner life was carried outwards. The visible body / part of the bowl on the screen shifts due to the rotation, so that in connection with the black background, a breathing, cosmic and circular movement seems perceptible. In the end, the bowl turns in the other direction, the video starts from the beginning. To give up the desire for perfection from the world of form and concept to a world open to an emotional, truer and more beautiful view of life. The video's contemplative images in motion also demand of “[...] the eye that it be patient and become accustomed to that which is approaching it [...].”* The future is condensed into an extended present. A Zen master describes the behavior of the bowl as that of water - flowing silence; its calmness like that of the mirror - recognize YOUR self; her answer is like that of the echo - audible only to the people who call. *Quoted from Friedrich Nietzsche. Byung-Chul Han, Müdigkeitsgesellschaft, Matthes & Seitz Berlin, 2010. p. 39.